Home » Asia » Cambodia on the Cheap » Sihanoukville, Cambodia: Beach, Please! Watching the sunset with a cold draft beer. We paid $10 for a bus ticket from Siem Reap to Sihanoukville with Phnom Penh Sorya. We were told it would take nine hours; it took twelve, and included a bus change in Phnom Penh. The bus station in Sihanoukville is a little far from the beaches and guesthouse areas, and the tuk-tuk drivers/taxi drivers are not open to negotiation. We arrived after dark and took a taxi for $8. 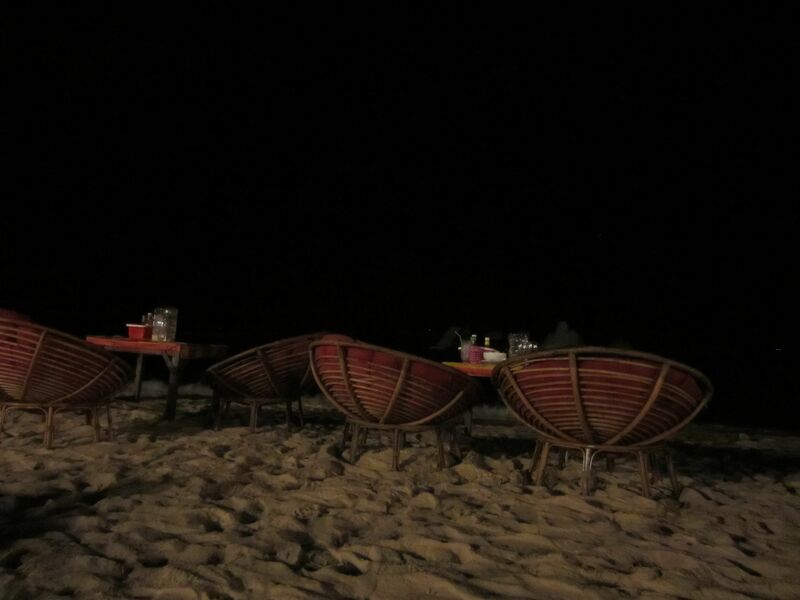 At night the restaurants set out comfy chairs and tables along the beach and start barbecuing. We stayed at Apple Guesthouse which was only a 2 minute walk to Ochheuteal beach ($8 fan room/$15 A/C). The best thing about it was Sister’s Cafe & Bakery. The breakfast was fresh and generously portioned, and the freshly baked bread was the best bread I’ve had in Southeast Asia. I highly recommend the chocolate chip pancakes. Make sure to order the French press coffee. It’s a little more expensive than the regular coffee, but much tastier and serves two people! We had a few days of luxury and enjoyed BBQ tuna and barracuda on the beach ($3), cheap draft beer ($0.50), $2 buckets of Mekong whiskey, and swimming in the warm water before packing our bags and shipping out to the secluded island of Koh Rong. Fresh BBQ tuna and barracuda with a beautiful view. Ryan enjoys one of the many $2 Mekong Whiskey buckets he consumed on his 30th birthday. How long do you give it till Cambodia is Thailand?